I am not making this trade with my own money. However, if I were to add a May position at this time, this is one trade that I would consider. 1) Expiration date. I do not like trading short-term options, so chose May, 45 days prior to expiration. I will be choosing both shorter and longer-term expiration dates as we make more trades. 2) Strike prices. Always a difficult choice and each Gold Member may ave chose something different. I wanted to collect a premium near 25 cents for the one dollar wide iron condor. It would have been very reasonable to move one strike price farther OTM on each side. 3) Neutrality and lack thereof. Distance: The puts are >8 points OTM and the calls are <7 points OTM Delta of short option: The put delta is -18 and the call is 13 Note that there is a greater chance that the put has a higher delta than the call, even though it is farther out of the money (OTM). This is due to volatility skew and is a topic we will discuss at a later time. Clarification The put has a higher delta than the call – even though it is farther OTM. This occurs because of the volatility skew. That tells us that there is a grater probability that the put will finish ITM. This may not feel ‘logical.’ However, history tells us that large down moves re more common than large up moves. Option buyers know this and they bid up prices for OTM puts, but do not do the same for calls. Position delta: NOTE: The call spread has + delta. But we are selling that spread, so for usa, the call portion has negative delta. The position is delta short. The bid ask market was .23 to .28 when I made the trade. I was filled at $0.235 because paper trading accounts are not realistic. I’m using a fill price of $.245 for any records that we keep. Strong suggestion, and always part of my iron condor plan: Forget that you own an iron condor. Manage this position as if you own two different trades: Short one call spread and short one put spread. The plan begins with a target profit and a maximum acceptable loss. This process becomes easier. However, for the rookie trader there is a conflict. The less experience that a trader has, the more important it is to make a plan and try not to stray from that plan. However, the less experience trader does not have a good feel for where to set those profit/loss targets. Suggestion: For your first few trades, make an estimate, but don’t stick to it. Be a bit flexible. But once you have traded a strategy several time, you should have some idea of what you ant to accomplish for the trade. It is truly a poor idea to make a trade without knowing the potential risk and reward. Profit target: We collected 24.5 cents per spread, or $490 for 20 lots. Plan A: Cover either side when it becomes available at two or three cents. Plan C: If we get an opportunity to earn > $1.00 quickly, grab it. Quickly means no later than April expiration. Addendum: $1.00 should read $$0.10 per iron condor. It does not refer to a profit of $100 for the whole position. Thanks to Chris for alerting me to the need to fix this statement. I was thinking in terms of a 10-point iron condor. I meant to say that if we can get 10 cents per iron condor quickly ($200 gain), then I would consider the quick exit. This chance does not occur often. Plan D: The maximum theoretical loss is $0.755 per iron condor, or $1,510. Let’s limit our losses to paying $0.55 for the IC, or a loss of $0.305 per spread. That’s $610. Plan E: Exit target. I hope to exit on or before May 6, or two weeks prior to expiration. Overall plan: We can be conservative, risk-watching traders, or we can be more aggressive and take a bit more risk. For this trade, it’s going to be the more conservative approach. That’s a simple plan for our first trade. We can pack more information into these plans, and we do so as time passes. SPY is essentially where it was when the trade was opened. The Iron Condor market is .20 bid to .23 asked. That means we could cover by paying $23 per iron condor. Only three days have passed and there is nothing to be done. This position is in good shape. Position is now short one put spread. There is no plan to sell another call spread to replace the one just bought. This is often a big decision. We can seek additional profits and make the spread nearer to delta neutral by selling another call spread. To do that introduces upside risks to the portfolio. It’s truly a trade-off. O prefer not to sell a new put spread. However, this is a topic worth discussing at some time – depending on how many members would prefer to sell that call spread. Current risk graph. 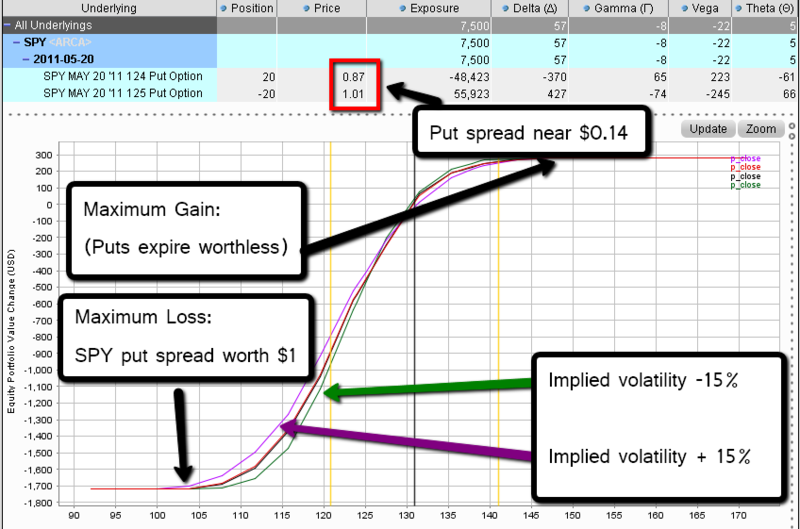 Note that there is no upside risk because we now are short one put spread (currently priced near 13 cents). For someone unfamiliar with these graphs and who wants to learn to get useful information out of them, here’s one example. Let’s say you want to not lose more than $500 from the point at which the graph was copied [If you are concerned with measuring the loss from the starting point of the trade, this graph does not accommodate that. The software of other brokers may do so. Do not let that be a problem. This graph values the spread at 14 cents. We paid 2 cents for the calls and traded the original iron condor at 24.5 cents. Thus, right now, we could exit at 16 cents total, for a gain of 8.5 cents X 2,000 (20 lots, 100 shares each), less commissions]. Look at the y-axis. Find the -$500 line. See where that interacts with the red line of the graph. It’s just under $125 for SPY. You nan make a close-up for a better picture, but what you want to know is that if SPY approaches $125 today, and if IV remains unchanged, you can expect to lose that $500. So what? Well, if that’s your exit point, then exit. If it is your ‘let’s see if we can adjust this position to cut risk and still have a position I want to own’ point, then look for a suitable adjustment. Beginners may not know how to do that yet, but all lessons cannot be given at one time. This trade worked very well. IV declined and we got out quickly. Great for the real world; less great as a learning experience. Profit 20 * $16.50 less commissions.